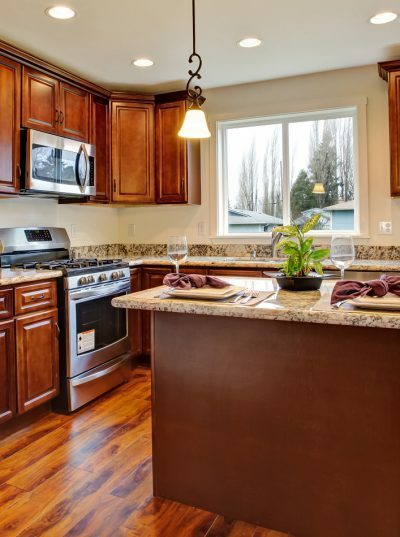 The beating heart of your home, a kitchen is arguably the busiest space where you live. It’s therefore likely you want furnishings that are practical, as well as stylish, like furniture and window coverings. You may favour a more classic look with wood and brick finishes, or like a more minimal, modern approach, making a feature of neutral colours and matt surfaces. With such a variety of different shapes and sizes of window out there, there are therefore a wide range of options for your kitchen. Not sure what window treatments would suit your space? Read on to find out more, or book a free survey with your local Shuttercraft today to investigate how shutters can benefit your property. Interested in new kitchen window covering ideas? Have you considered just how much of a difference new window treatments could make? Coupled with existing interior designs, or as part of a new renovation project, there are many styles, finishes and colour options that could breathe new life into your space. So what is most practical solution for kitchens? Is it a bare window, classic net, stylish shutter or a basic blind? When choosing the best window treatment for kitchens, it is important to compare the different options as each have positives and negatives, and may not suit your requirements. Whether you are looking for a modern solution for a standard window, over the kitchen sink window coverings, needing to avoid a prominent tap, or something to cover your patio doors, there are a variety of product choices to consider. Rather than standard curtains, which tend to be made of heavier fabrics, much lighter voiles and nets tend to be popular in kitchens. Lots are available on the market, including many that can be shop bought. Net curtains are popular, although these can easily pick up dirt and grow mould, whilst providing limited privacy. There is a broad range of off-the-shelf blinds on the market, which are very different in terms of style and light control. Whether vertical, Roman or classic Venetians, these tend to vary in effectiveness at providing privacy, often be easily damaged and being lightweight can bang against the window in a breeze. As these are usually more of a bespoke choice, a shutter tends to be the more premium product available for kitchens. They are easy to keep clean, and are almost certainly the most stylish choice, from traditional solid wood shutters through to more contemporary designs. Window film acts much like a net curtain, providing limited shading. As they only reduce the light rather than blocking it out, films are often combined with other window coverings. Going minimalist, lots of people throughout the UK are now opting for no window treatments at all in their kitchens. Although you may benefit from an unrestricted view of your garden, a bare window provides no light control, privacy or insulation. Another factor to consider is the actual shape and size of your window. Special shapes like arches and triangles can be tricky to cover. Unlike curtains, blinds, or tinted film, shutters are often made-to-measure, fitted to the window exactly, emphasising these beautiful and unique home features. In addition to considering the latest styles of window coverings, thinking about the pros/cons of each solution, there are also other practicalities that need to be taken into account for your kitchen. 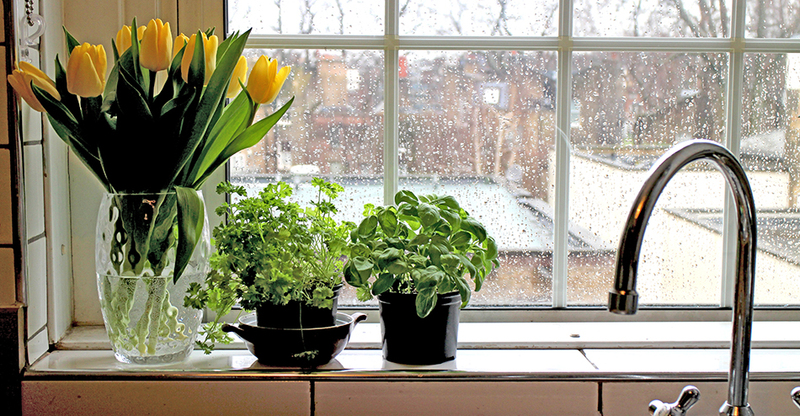 To ventilate a steamy kitchen, it is important to be able to easily open a window. Patio doors in particular also need to be accessible, so an option like shutters that can easily be opened would be a good choice. Kitchens can be more humid than other rooms, due to increased levels of water vapour in the air, even with an extractor fan. A waterproof window covering like ABS shutters would therefore be worth considering. As well as water in the air, kitchens are also prone to damp in other areas, such as condensation on windows or around / over the sink. Fabric or MDF window treatments would therefore not be a good idea, as these experience issues in damp environments. In use every day, kitchens can quickly build up dirt, so think about window treatments that can be easily cleaned. Rather than relying on a washing machine, an ideal choice would be one that can be cleaned with just a quick wipe with a cloth. This is especially important for family homes. Your window coverings should be built to last, keeping them looking good for years to come, regardless of how active people are in your kitchen. As well as blocking out sunlight (or streetlights at night), the right window coverings also provide a degree of privacy. Popular choices of window treatments for kitchens include traditional net curtains or more modern plantation shutters, which help screen off your home. Having something in your window stops people watching you do everyday tasks like washing up or making a cup of tea. What makes shutters a great choice for large kitchen windows? 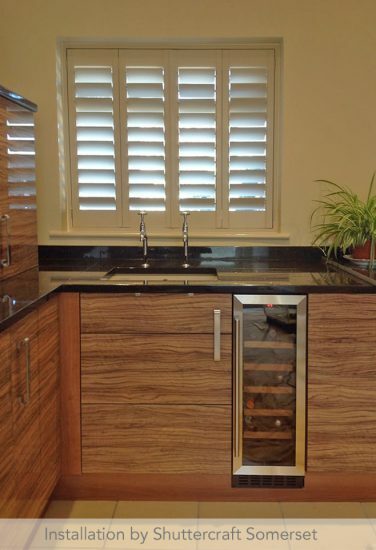 As both a stylish and practical fitting, plantation shutters can be found in kitchens all over the country. Available from Shuttercraft in the waterproof Java range, they are simply hinged to allow access to both sash windows and patio doors. There are a number of shutter styles to choose from for your kitchen, including full height, tier-on-tier or cafe style, which only cover part of the window. Each has a slightly different way of controlling privacy and light, as well as providing a degree of insulation. To help create a more modern look, even in older properties, the crisp lines of shutters provide a contemporary appeal. With your friendly local Shuttercraft, you can find shutters in a range of on-trend colours such as Sea Mist or Stone Grey, as well as standard white. Rather than simply settling on off-the-shelf window treatments such as Venetian blinds, if you’re worried about the size or shape of your window, then a more made-to-measure solution like shutters will help give you peace of mind. If you want to revisit your kitchen design ideas with a more modern look, there is no time like the present. To benefit from modern window coverings for either large or small kitchen windows, patio doors, or even as a room divider, look no further than your local Shuttercraft. We help you choose the best window treatments for your kitchen. 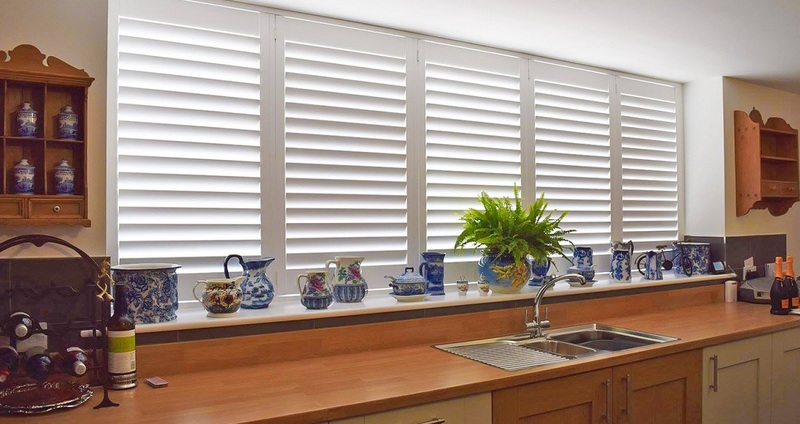 Large or small, and in a plethora of shades and styles, why not contact your local Shuttercraft specialist to find the perfect kitchen shutters for your home.